If you’re looking for outstanding barbecue, it’s tough to beat Austin, Texas. And if you’re eating barbecue in Austin, the place to be is Franklin Barbecue (flaunting a famous 4-hour wait). Its owner Aaron Franklin holds a James Beard Foundation Award for Best Chef in the American Southwest. Not bad, considering James Beard pays about as much attention to barbecue as it does to bubble gum. Chef Franklin has already shared his meat smoking expertise in the 2015 book Franklin Barbecue: A Meat-Smoking Manifesto. For his second book, he’s tackling a culinary obsession that he often cooks at home — steak. 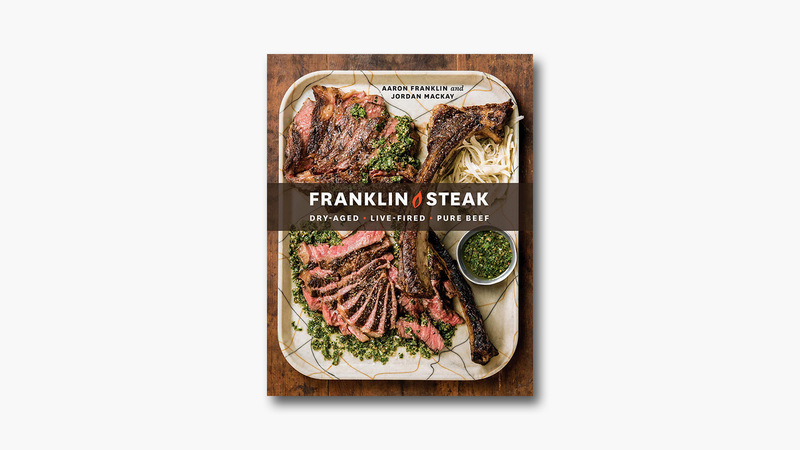 Authored in partnership with fellow James Beard award winner and food, wine, and spirits writer Jordan Mackay, Franklin Steak: Dry-Aged. Live-Fired. Pure Beef. examines the art and science of grilling steak like no publication that came before it, spanning cattle breeds to custom grill building instructions in over 220 pages.